Many people love black for home interiors, but some avoid using it for a few reasons. Common worries include creating too dark a space or that using black will make small spaces feel even smaller. Black evokes feeling of elegance, sophistication, and creates an air of mystery. The color works well with many design styles, including modern, contemporary, traditional, or sleek minimalist kitchen designs. If you want to bring mystery to your kitchen with black, this can easily be accomplished without making the space too dark. It isn’t about filling the room entirely with black. The idea is to give the kitchen pops of black that stand out as focal points. The goal should be to create a balance of light and dark elements. You will need to decide where to use black in the kitchen. There are several options, such as black granite countertops, flooring, cabinets, or an accent wall. Countertops – You can pair all black kitchen countertops with white cabinets or grey cabinets. 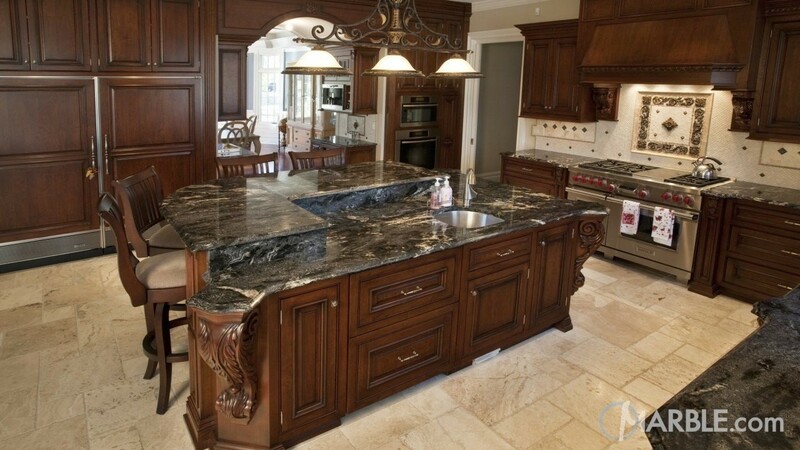 The natural stone industry offers gorgeous options for black granite countertops, such as Absolute Black granite. Continue the contrast by adding a white farmhouse sink to the black countertop. Backsplash or Wall Color – Use black on the walls or for your backsplash. A black granite or tiled backsplash creates a stunning look in the kitchen. If you want to use black on the walls, but don’t want to be overpowered or make the room seem too dark, you can paint one solid black accent wall in the kitchen. For a visually stunning look, create a black geometric pattern on a wall or backsplash with black and white tiles or paint. Cabinets – Black cabinets bring mystery and modern sophistication to the kitchen. Black is often associated with contemporary and ultra-modern design styles, but adapts well to any style. Black cabinets can be found in matte, satin, gloss, or antique finishes. Cabinets in this color are available in sleek contemporary designs and traditional styles with decorative moldings. If you want to break up the black, consider black cabinets with glass door fronts or black cabinets with white, sleek doors finished with black hardware. Another way to use the black and white color pattern is to use a black kitchen island in a white kitchen, such as white cabinets with a black granite kitchen island. Appliances – You can continue the look of your black cabinets with black appliances or break it up with either white or stainless steel appliances. Stainless steel has been popular for several years now. However, black appliances have been gaining in popularity recently. Most major appliance brands have responded to the trend by adding black appliances to their lines. They can now be found in almost all price points, so it is easy to find black appliances to fit the style of your kitchen and your budget. Flooring – A few different options are available for black flooring, including black ceramic tile, black marble, black leather tile, a concrete floor with a mottled black stain, or stained black wood floors. If all black feels like too much, consider alternating black and white tiles. Black and white tiles in a checkerboard pattern adds a great retro look to your kitchen. Once you have decided where to use black in your kitchen, make everything else in the room white or another color, such as grey. The combination of black and white, black and grey, or all three colors together creates a visually stunning aesthetic in the kitchen. Whether you use black granite countertops or another color for your kitchen, caring for your new kitchen countertops is essential. Use a high quality product, such as Mr. Stone’s AGM Daily Countertop Cleaner. Mr. Stone AGM Daily Countertop Cleaner is formulated for granite and marble, so you can clean your new countertop without risking damage to the stone. We at SlabMarket connect professionals in the natural stone industry and provide access to quality stone from around the world at a competitive price. If you own a slab yard, join us to increase the variety of products available for your customers. Add a few slabs to your container in a variety of stone colors, especially dark granite such as Absolute black granite. Add other granite and marble slabs also to satisfy customers who are planning to bring mystery to their kitchens with black kitchen countertops. There are a variety of ways to bring mystery to your kitchen with black. Careful design planning can ensure that you have the right balance of dark and light design elements in your kitchen. Consider your options and budget to select the elements and atmosphere you want to create in your home.